Misano Adriatico has its roots in the fertile Roman period. The name derived from that of various gens who moved to live in the countryside of Rimini. In the 3rd century. B.C. in the territory of Misano came in fact “Gens Mesia”, thanks to “Ariminensis ager”, the number of lands and possessions of Rimini that the Empire lavished to war veterans or to the nobles of Roman society for special merits. The history of Misano is connected with Rimini, like many locations in Romagna. From 1295 to 1528, Misano lived moments of glory and power under the guidance of the future capital of the province in a prolific period of history and art. Thanks to Malatesta, who did even build a castle here (today there are unfortunately only ruins), Misano became a splendid town. The Romagna then with the decadence of the “signori” become prey of the Pope’s greed. As soon as the hegemony of Malatesta flakes and until the unification of Italy, Misano belonged steadily to the Stato Pontificio. In 1938 the town was known, however, with another name:,”Villa Vittoria”: it had this name since 1862, but then during the fascism that agricultural area became “Misano Adriatico”. The name change does it profit, and in the boom years Misano becomes highly tourist, tracking and seeds thrown in this direction already in the thirties. Today we have many well-known structures, such as hotels and hotels, residences and camping. For fans of the beach and engines, Misano Adriatico is the tourist destination to visit if you have a F1 passion. To spend the holidays in the city of Misano Adriatico means definitely to get you inside history and culture, looking for inland castles and medieval fortresses. The beach at Misano is among the best in Riviera: umbrellas, lifeguards, rescue services at sea. The accommodation facilities for families offer great spaces: games for children, and there are many sports facilities at the beach with the bowls, beach volleyball, beach basketball gyms. In the evening you will end up on the piers of Misano and Portoverde: you might want to be really romantic and go with your partner for a ride on a boat along the coast in the sunset! 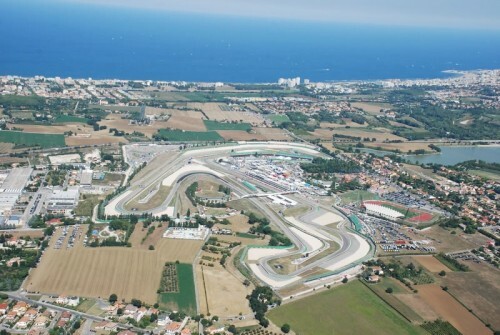 The Autodromo Santamonica in Misano Adriatico, now called the Misano World Circuit, is of great interest, too. The Superbike World Championship and the the European Championship Truck are hosted here, too. During the weekend you can also see the free practice in the circuit. Experience the thrill of renting the track all day: the Autodromo Santamonica is the only facility in Italy to be completely illuminated at night. The Misano World Circuit, as it is called today, brings the charm of breathtaking races to all the F1 aficionados:. Athletes from around the world arrive in Misano Adriatico to see motorcycles and cars flying along the dangerous curves. It was designed and built by engineer Cavazzuti under the guidance of the great Enzo Ferrari. The track was then tested in 1972. If you are passionate or just curious of the highly anticipated Moto GP, look at offers for stays and experience the racetrack in its splendid matches. The Romagna, you know, is a land of great drivers: Loris Capirossi, Marco Melandri, Marco Simoncelli, Mattia Pasini, Valentino Rossi and Alex De Angelis of San Marino that you will see into challenges on the asphalt in the Santamonica. Misano Adriatico lives immersed in local tradition and the thousand-year history of the Middle Ages and Renaissance. Pedestrian areas coloured by evening markets, a golden beach and quiet, a promenade of 2 km along the seafront, islands of green in the centre complete the picture of this town. Thanks to the organizational structures and the quality of bathing water and the beach in Misano Portoverde, starting in 1989 the town has been awarded several times with the blue flag of the European Foundation for Environmental Education (FEE). This award crowns years of commitment to environmental protection. Come and discover the green town, then! The east area of Misano Adriatico is starring the beach, and thanks to its proximity to Rimini and Riccione, the fun continues all along the Adriatic coast, while south-east there is to visit the River Basin and its natural oasis, located along the its slopes. Also its surroundings are very intriguing. To the south–west there are the hills with a view that looks hinterland to ancient medieval villages to discover. Misano Adriatico is in fact just a few kilometers from the Marche–Romagna, easily accessible for tourists who want a holiday with more cultural visits to historical and artistic heritage. From Misano Adriatico you can head to San Marino and Urbino, but also to Verucchio, the cradle of the Malatesta, whose Rocca allows visitors to embrace with his eyes all the coastal part up to Rimini. Montegrimano with its spas facilities and Gemmano with the Caves of Hell, characterized by the presence of karst stone are masterpieces of nature. Turning to the castles and fortresses, strongly recommend Montegridolfo with the best preserved castle of the Marche – Romagna and other destinations in the same way as precious as Montefiore, famous for its beautiful fortress, Torriana and Montebello again with imposing fortresses. A visit is worth to Saludecio, known for its many events of cultural and gastronomic tone, and Mondaino with its Palio del Daino. Finally, immerse yourself in the village of Montebello to discover of the ancient legend of Azzurrina. Do not forget that Misano is not far from other important Italian locations; just 15 km from the fun of Rimini, 40 km from San Marino, 45 km from the marvellous Urbino, 10 km from Gradara an its romantic and tragic castle, 65 km from Ravenna and the Bysantine remains. This entry was posted on Friday, November 28th, 2014 at 7:43 pm	and is filed under Discover Italy. You can follow any responses to this entry through the RSS 2.0 feed. You can leave a response, or trackback from your own site.